Thanks to the NPR blog a blog supreme I came across this podcast the Jazz Session. A little bit of background on the blog and its creator Jason Crane. Since its inception in 2007, there have been more than 1.7 million downloads of The Jazz Session episodes. The Jazz Session focuses on in-depth interviews with jazz musicians, along with occasional interviews with producers, authors and others in the jazz world. The show’s mission is to chronicle the lives and opinions of musicians who make creative improvised music, without regard to artificial genres or labels. 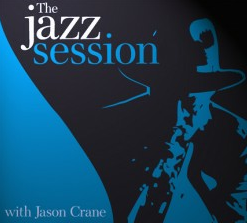 Every episode of the show is available here at thejazzsession.com for free. You can also subscribe for free via iTunes or an RSS reader. Jason Crane was born in 1973 in Lenox, Massachusetts, home of Tanglewood and former home of the famed Music Inn and the Lenox School of Jazz. He began his career as a soprano sax player in jazz, latin jazz and funk bands in Arizona, Pennsylvania, and on Hilton Head Island. Jason also worked as an on-air host for KUAT and KUAZ in Tucson, AZ; as a news announcer for Bloomberg Radio in Tokyo, Japan; as Tokyo business correspondent for NPRâ€™sMorning Edition; and at WXXI in Rochester, NY. From 2001-2004, Jason was station manager and jazz host atJazz90.1 in Rochester, NY. In 2005, Jason hosted The Jason Crane Show, a progressive political talk show on Rochester’s Air America affiliate. This entry was posted in discussion, funny, jazz, Live and tagged interviews, jazz, music, news, podcast, radio. Bookmark the permalink.